BusyGamer.com [The Official Busy Gamer Website] » Blog Archive » Girl leaves world with a game about her disease. Girl leaves world with a game about her disease. Sofia Wardle, a young girl with a rare disease, left the world with an interactive game that raises money and teaches people about the cancer-like illness that took her life seven months ago. Sofia suffered most of her young life in and out of a hospital after a three-year battle with the disease histiocytosis. During her time here, her father (Dave Wardle) began creating a game called “SofiaMaze”, an online interactive artistic maze. “It’s a maze made up of pictures that take you on a journey that starts at Sofia’s home in Aptos,” said Wardle, who took a sabbatical from his job as a computer consultant to help build the game and Web site with his daughter. This game teaches people about histiocytosis, a rare blood disease that is caused by an excess of white blood cells. The white cells, called histiocytes, cluster together and attack the skin, bones, lung, liver, spleen, gums, ears, eyes and central nervous system. “It’s one of those diseases you never really think about unless you know someone who had it,” Wardle said. The goal of the game is to get to Lucile Packard Children’s Hospital in Palo Alto while stopping at Sofia’s favorite spots through Santa Cruz County, on Highway 17 and over the Santa Cruz Mountains into the south Bay. 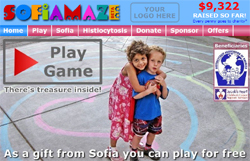 The site also raises money for histiocytosis research. Sofia aided in the development of the game, with everything from the color schemes to the fonts and logos. Unfortunatley, Sofia was never able to see the completed project, and her father finished the Web site and interactive game on his own. The site launced Friday on what would have been Sofia’s 8 year birthday. You can view the game at www.sofiamaze.com. This entry was posted on Tuesday, April 28th, 2009 at 12:01 am	and is filed under Gamer News. You can follow any responses to this entry through the RSS 2.0 feed. Both comments and pings are currently closed.